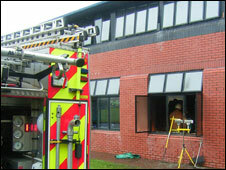 An arson investigation is under way after a petrol bomb was thrown through a school window. The caretaker at Walney Comprehensive in Barrow, Cumbria, spotted the flames as he arrived for work on Wednesday. The fire was confined to a classroom and quickly extinguished by fire crews, but not before thousands of pounds of damage was caused. Head Teacher Alan Dickenson said the 600 pupil school was likely to be shut for the rest of the week. The closure will cause disruption for some students currently preparing for their GCSE examinations. The fire is believed to have been started between 0600 BST and 0700 BST, according to Cumbria Police. Anyone who witnessed suspicious activity in the area should contact the force.